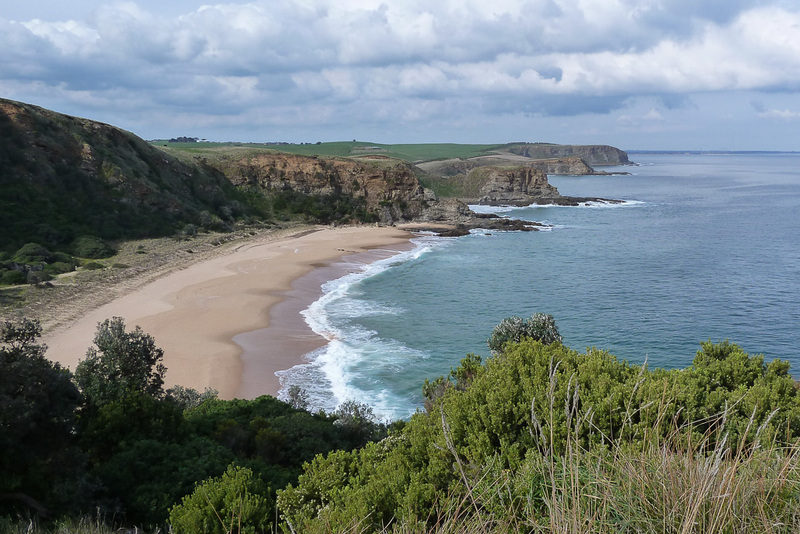 The George Bass Coastal Walk follows the coastline from Punchbowl Road near San Remo to the town of Kilcunda. It’s rated as ‘easy’, which suited my ‘neck recovery mode’, but unfortunately it was an ‘out and back’ job. A 7 km walk, so we had to retrace our steps back to the car. It’s never been my favourite method of walking, but not having anyone to do a car shuffle with meant it was the best we could do. 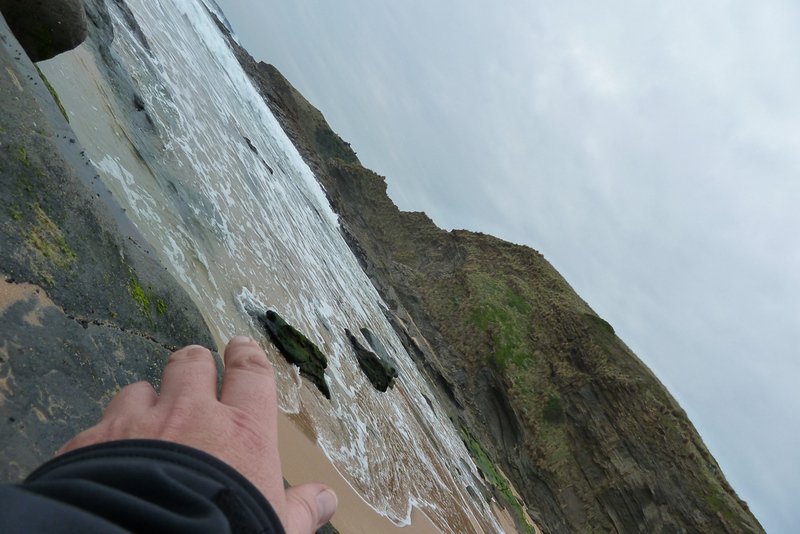 I figured we could walk on the beach as much as possible on the way out and come back via the top of the cliffs for a speedy return. I might throw in the odd photo, such as the one above to break up the paragraphs, as I’ll quickly describe what was going on before we made it to the actual walk. A while ago I bought a Western Mountaineering AlpinLite sleeping bag, which I’ve wanted to try out for a while, but haven’t been able to since this prolapsed disc saga. It was going to be cold in Melbourne on the Friday night before the walk, so I thought I should give the bag a go, just for the hell of it. Cold night? Sure, this bag is rated to -7° C (20° F) so I was confident I wouldn’t be chilly. I went to bed bagged up and found out the night wasn’t as cold as what I’d imagined it would be. I woke up as if I was inside a furnace and spent a few minutes desperately trying to escape the flames. I noted as I got into my actual bed that besides feeling hot, my throat was sore. Not much of a problem and I assumed I’d be fine in the morning. Except I wasn’t. I woke up a few hours later as if my throat had been polished internally with a brillo pad. Yes, I had a cold of some description and felt like absolute rubbish. Ben was up at the same time and mentioned, “I’m coming down with a cold I think. I’m feeling crap.” Great, the double sick combo, but a fine sunny day for walking was on the agenda, so we did continue with the plan. It was interesting heading out under grey skies wondering where the fine sunny day was. Maybe it was a city thing though and the coast would be clear. If we could get there, as we endured a lovely log jam of traffic that Melbourne dishes up these days, whilst we were continually coughing and sneezing. A quick pit stop was required to get some butter menthols for the day and I did get to reflect the new sleeping bag may not have been the reason I woke up dying of heat exhaustion. I was already sick before getting into it, so the jury’s out on the heat that bag can produce until I’m germ free. A few hours of driving and we arrived at the Punch Bowl Road car park, which was the starting point for the walk. The sky continued to be a complete white-out of solid clouds and combined with no wind I was getting pretty suspicious about the ‘fine and sunny day’ forecast. 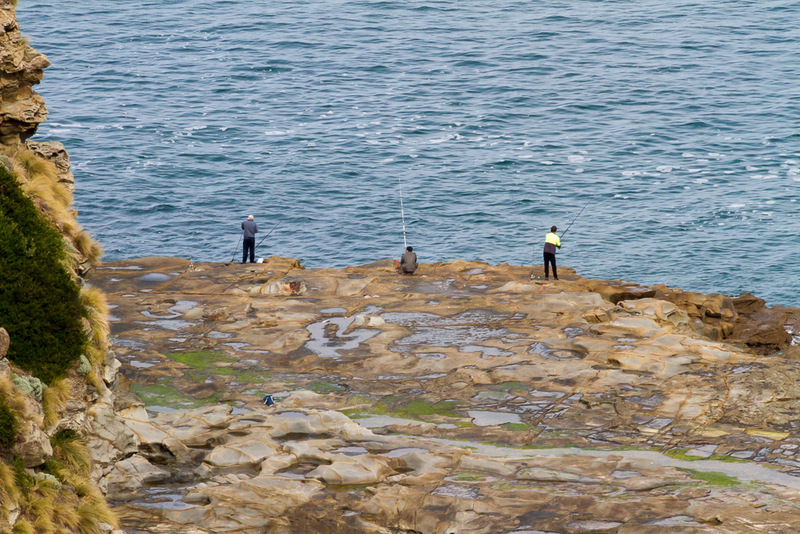 There were plenty of parked cars as well, as the area is known for rock fishing and also notorious for the blokes who seem to get washed off the rocks and never seen again. 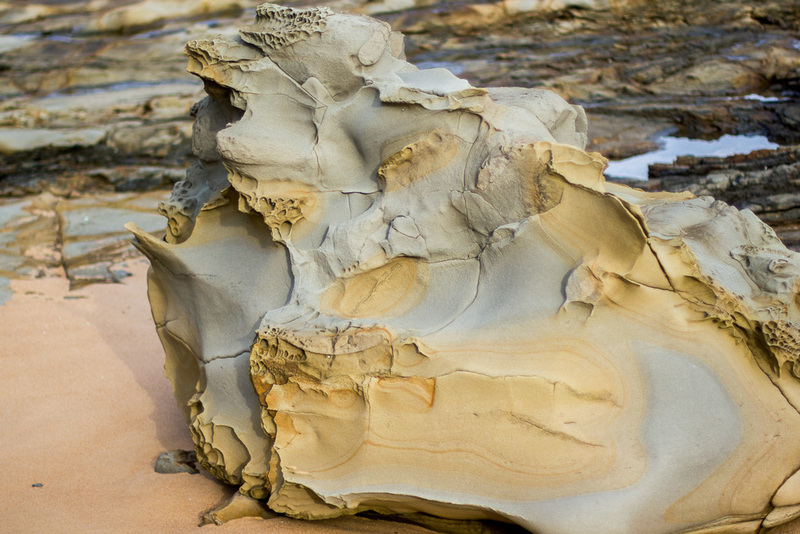 I’d never been to this area before, but when I looked at one rock shelf it did look pretty exposed to the unexpected wave, but it was proving to be a popular spot to be. Well, off we started and within about 30 seconds of walking I spotted the first horror of the day. An absolutely enormous house sitting on a nearby hillside that’s coloured in something similar to ‘Barbie’ pink. I’m not sure who approves the planning permits, but this joint is not remotely discreet and I almost felt myself vomit at the sight of it. It reminded me of a bloke who I knew in the army who flaked out half plastered on his bed at the barracks and woke up by performing a power-spew. Even today I’m not sure how he did it, but by defying gravity/physics/divine intervention he managed to vomit with such velocity that it connected with the ceiling fan above his bed. Now, we didn’t have any old ceiling fans in our rooms. 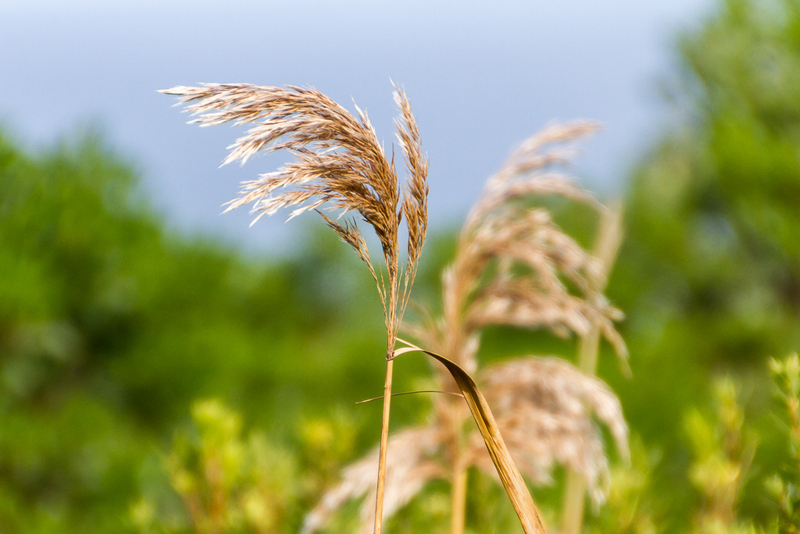 Ours were more of an industrial variety, that seemed to be modelled on the blade of a Chinook helicopter and when running on a hot night sounded about the same. With the mind bending spew striking the blades running at full speed, his room was converted into an instant ‘vomitron’. Quite a brutal story, but that’s exactly how I felt upon sighting the ‘Barbie’ house. Certainly, money doesn’t buy taste. I’d include a photo of it, but as I check out my blog now and again I don’t want it tainted by such a piece of crap spoiling the virtual pages. Anyway, I stumbled on from the shock of what I’d seen and kept my eyes facing the ground, just so I didn’t accidently get my retinas burnt by the hot pink house. 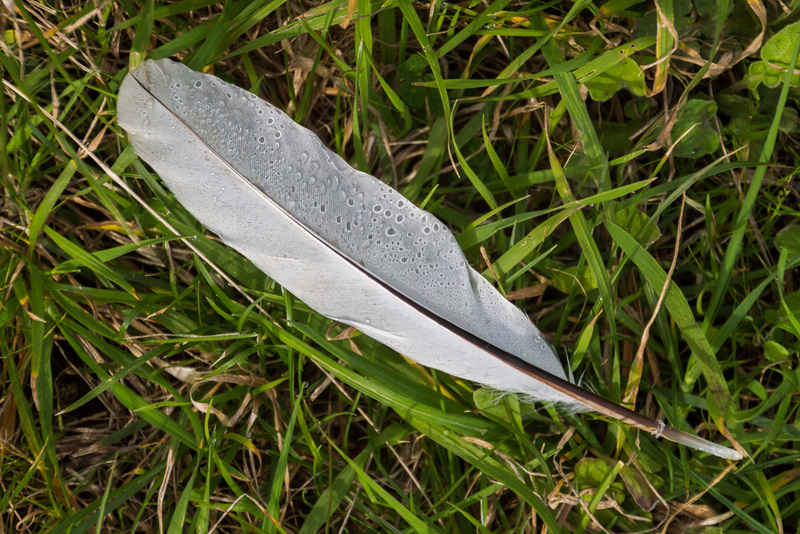 This method was a bonus, as I spotted a nice feather covered in water droplets lying in the grass. 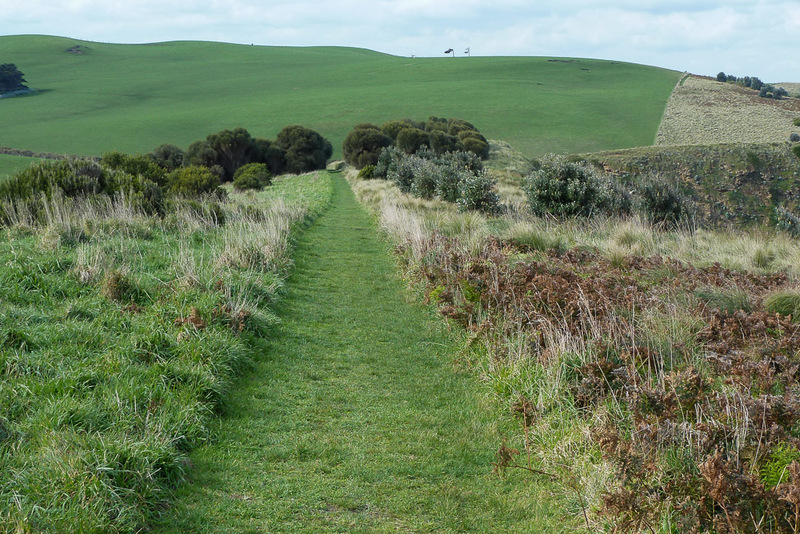 It’s an interesting walk along the top of the cliffs and I noted a sign saying, ‘…track built by trainees from Wonthaggi on a Landcare Environment Action Program (LEAP) in May 1994″. The only ‘LEAP’ acronym I’d heard of before was the ‘Law Enforcement Assistance Program, which is another thing altogether. Judging by the track surface, I think a ride-on mower was a major part of the construction technique, as that’s what the path feels like and it makes for very casual walking. 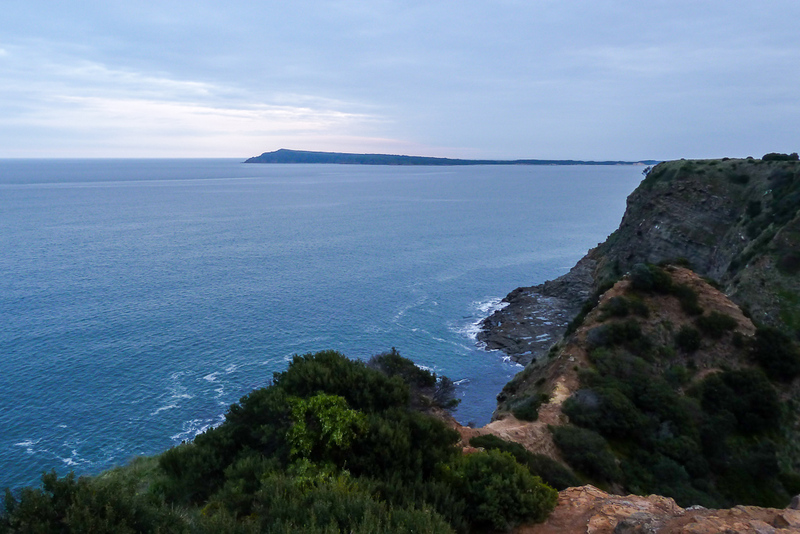 It was a pity the sky was totally washed out, but there were some nice views back to Phillip Island with the peak of Cape Woolamai visible where I’d walked a few weeks ago. Phillip Island and Cape Woolamai in the distance. Ben by now had raced ahead and I was checking the map for the first point of interest. A spot called Half Moon Bay. A lot of the beach sections of the walk are only accessible at low tide, which wasn’t in our favour, as high tide had been reached only an hour before we started. I sure wasn’t going to continue along the mowing track though and at first opportunity I was hoping to hit the beach and see how we’d go. 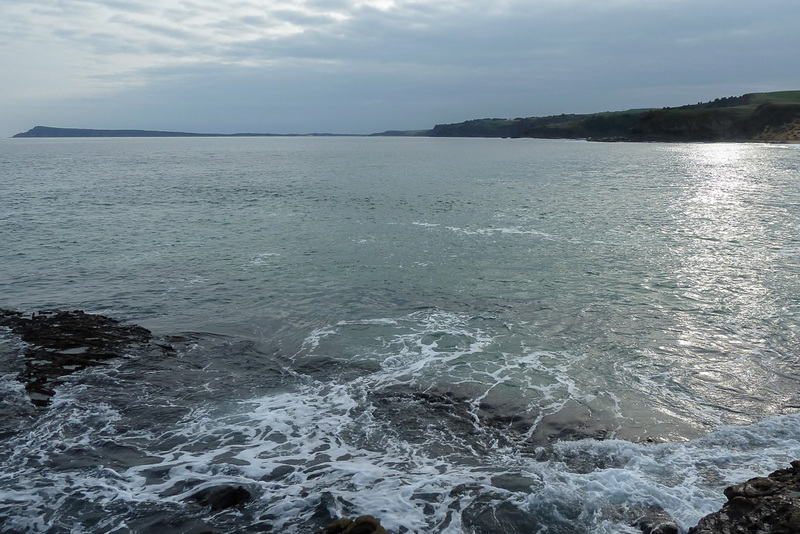 On such a calm day I was hoping it would be fine for a bit of rock hopping. There was the odd walker heading back the other way, which meant they’d probably started a lot earlier than us! I finally came across Ben waiting at the intersection of track that led to Half Moon Bay and with the inviting looking sand we headed straight for the beach. If we leave at the same time, how does one get so far ahead? 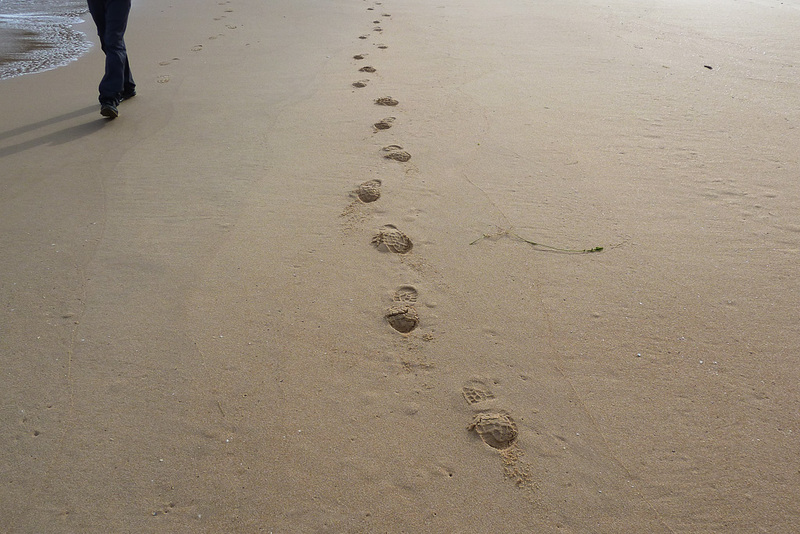 I’m not sure how Ben got so far ahead, as I was still on the track going down when I could see him on the beach already, about 400 metres away. Mm… I must be slightly slower in walking than I even thought I was. I did get delayed on the way down by taking the odd photo and I was even more impressed to come across some Pac-Man rocks. 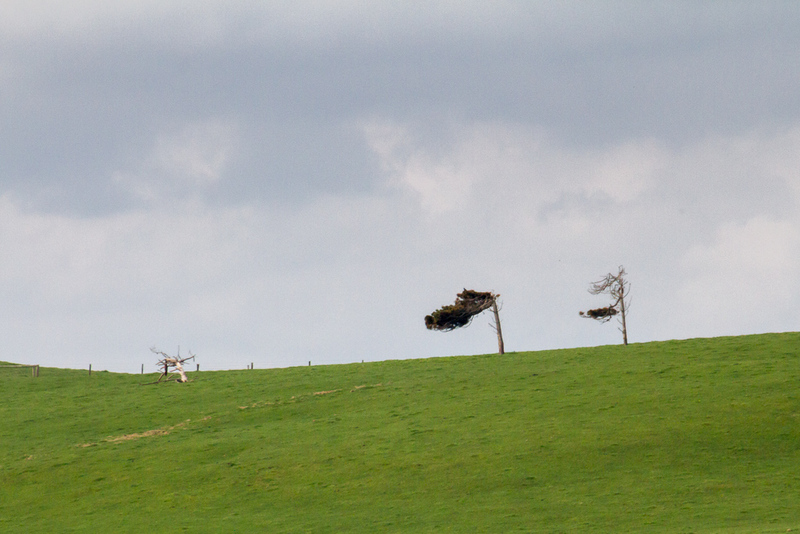 This is how bad my ‘epic’ walks are getting when I’m on the look out for crap like this. 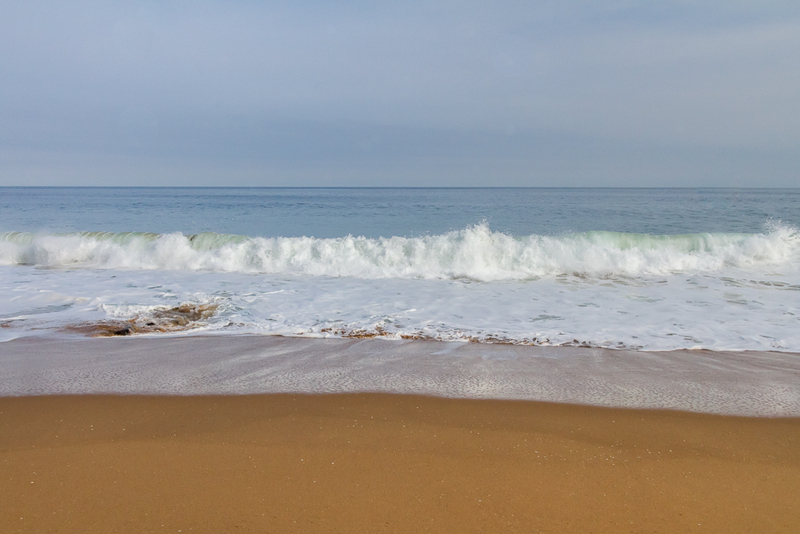 Half Moon Bay is a great little beach and what I found surprising was there wasn’t one piece of rubbish or driftwood on it. 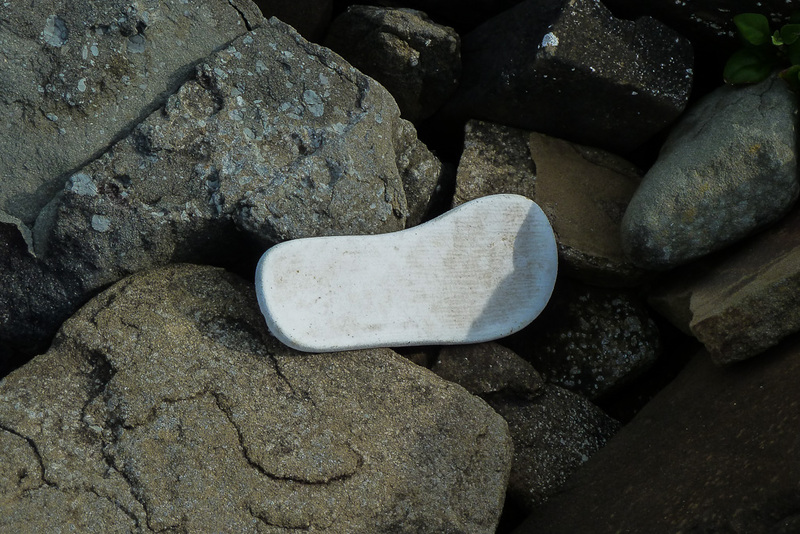 The sand was perfect and I was suddenly worried that, ‘on every beach walk I find a shoe’ record may be broken. 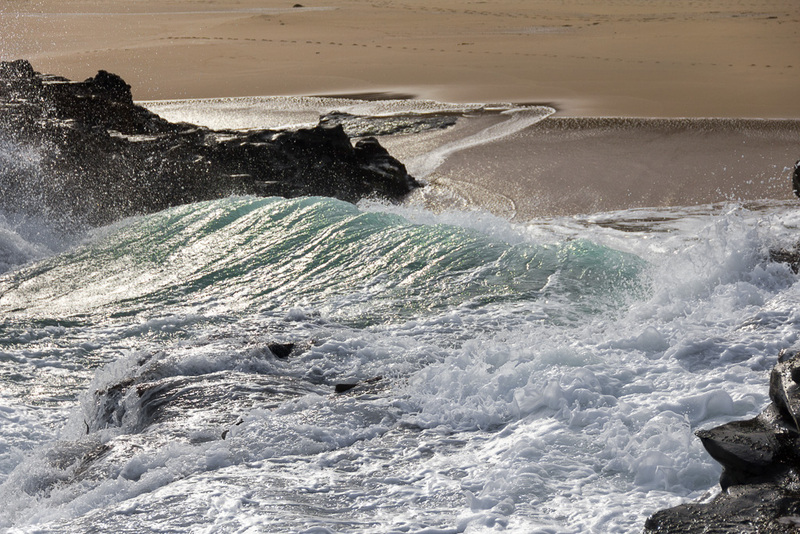 There was an opportunity to take some photos as the small swell lazily rolled in. There appeared to be no problems sticking to the beach for the time being and the walk was a lot more interesting at sea level. 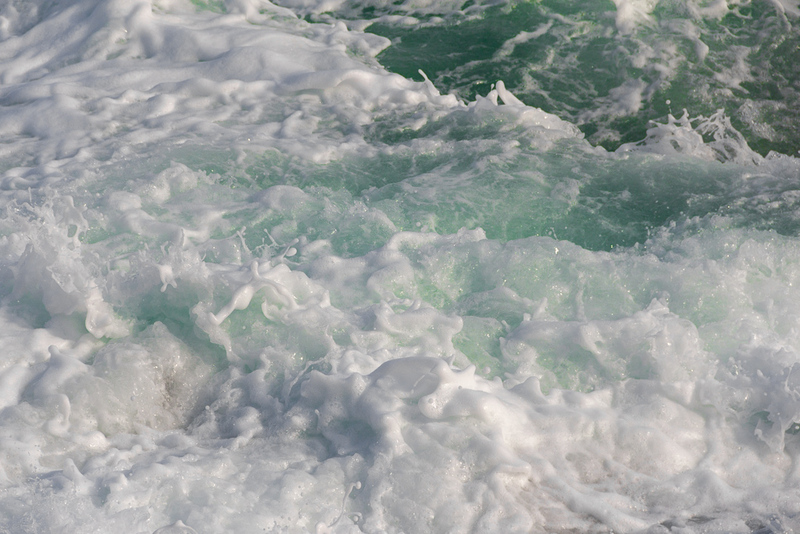 I had a chance to capture a wave hitting a rock, which was more soufflé than ocean. 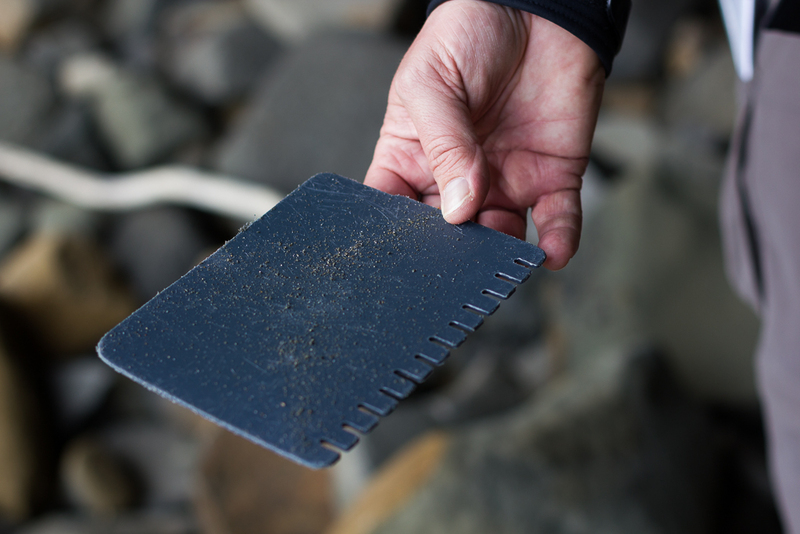 The only thing of note washed in was the largest cuttlefish bone I’d ever seen. I took a photo, but I should have placed an object next to it as a size comparison. Maybe a tractor tyre or similar. Oh well, take my word it was massive. We continued on and there was a nice gully between the rocks where the waves were rolling in. It would definitely be a good spot to be on a lousy day, with the wind blowing and a larger swell, as even on this calm day there were plenty of photo opportunities. 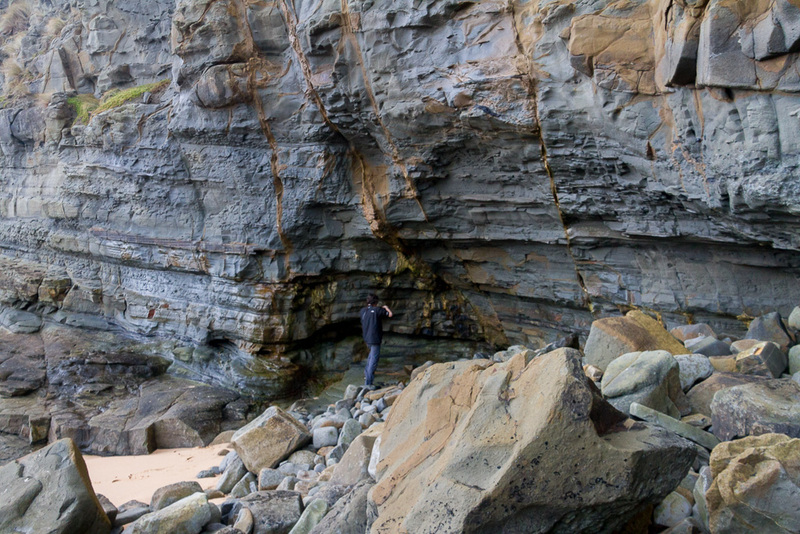 We left the sand and now there were a few rocky headlands to walk around. 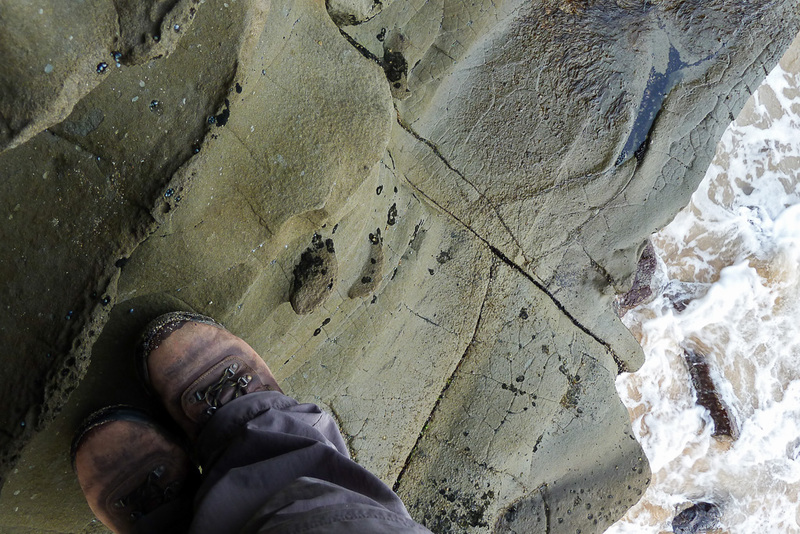 During this section of rock walking I began to feel relieved about my ‘shoe on a beach’ record. 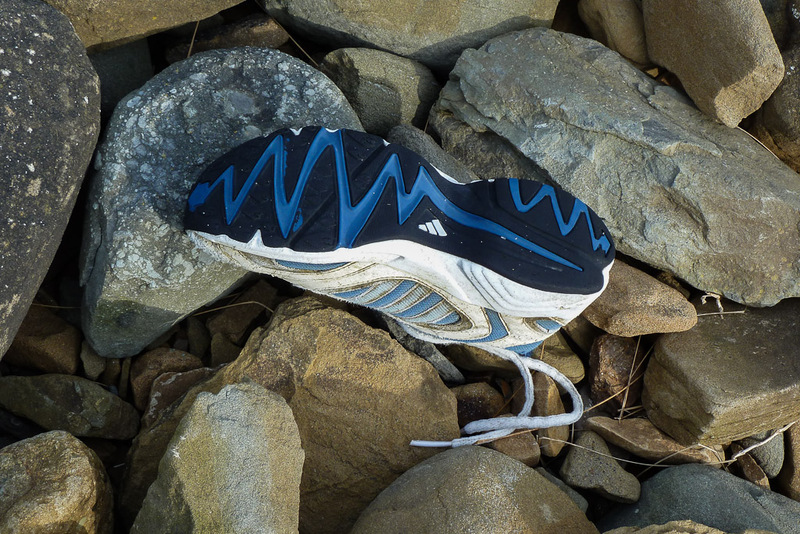 I could see in the distance amongst the rocks, a pile of driftwood and I felt a shoe was ready to give itself up at any moment. 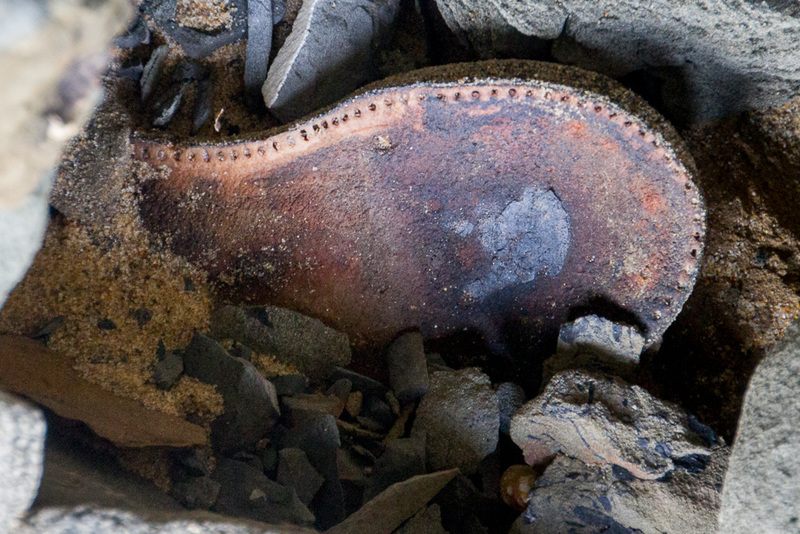 It’s strange how the ocean deposits its junk in certain spots, as the sandy beach had none, but just over a hundred metres away on the rocks there were piles of it. The tide was out enough for us to get around okay, although there was one section where a bit of balancing was required to negotiate some rocks above the water. I certainly went into concentration mode whilst doing this ‘ledge work’, as this is the sort of place I’d normally be finding myself flat on my back. The foot is in mid air! Incredible drama! 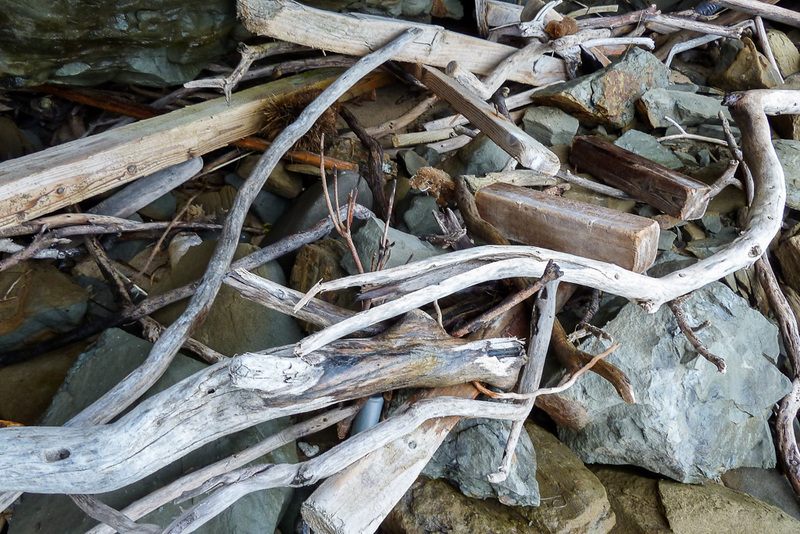 After the suspense of ledge walking it was back to a rocky cove where the driftwood was sitting. I could sense a shoe at any moment. 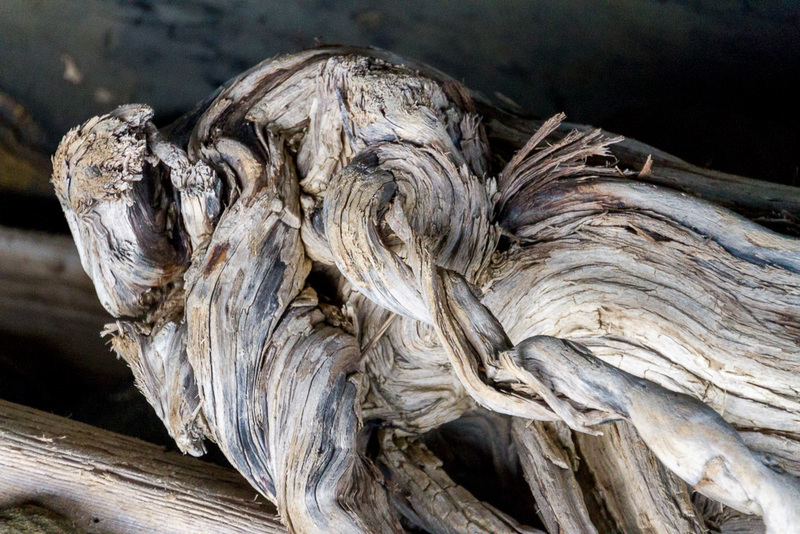 A quick perusal of the driftwood and I found what I was looking for to keep the 100% record going. 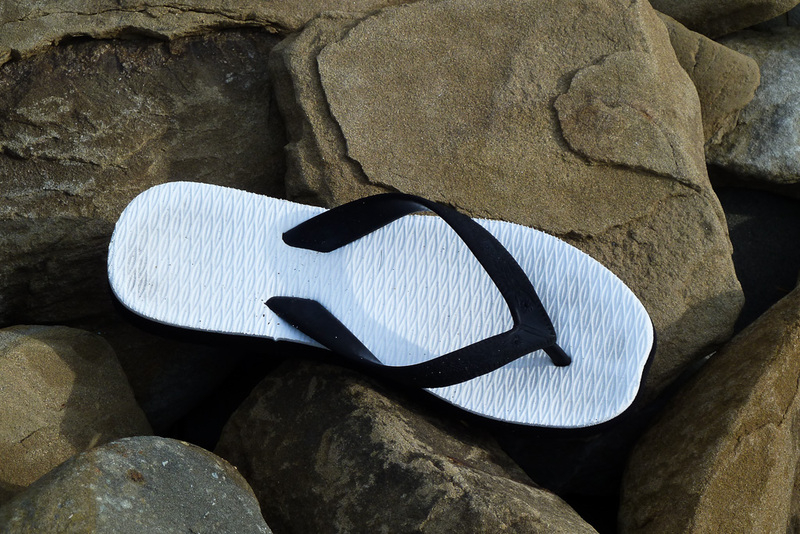 There was some slight controversy though, as we disputed whether a sandal is a ‘shoe’. Okay, it’s footwear, but the consensus was it required an upper to be a shoe. The rules are pretty strict on these records, so I had to keep looking as Ben was keeping me honest. He took off to investigate an interesting rock wall, whilst I was fossicking amongst rubbish trying to find a spare shoe anywhere. 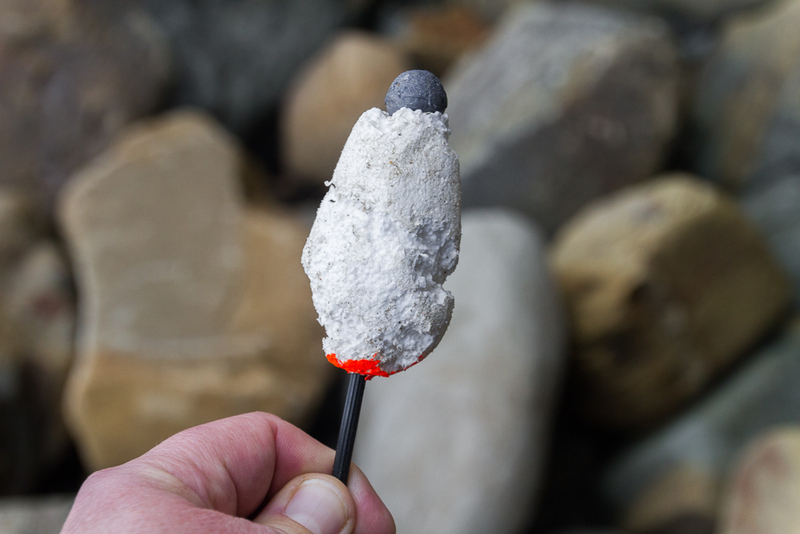 I found the usual suspects of fishing equipment and was intrigued by something that looked like sherbet on a stick. Unfortunately, it turned out to be a float with a sinker attached, which was disappointing, as I felt like a bit of sugar to keep me going. In this vast booty of lost and discarded items I thought I’d found a massive comb. If my hair was a little thicker I’d use it for sure. Continual fossicking led to some nice ocean weathered timber lying around and it’d be great to have some of it at home to make a feature out of. Then again, most of the pieces I liked were enormous and Ben reminded me I had a hatchback car, instead of a truck to put them in. Logic is tough to deal with at times. Oh well, it was photos only on this occasion. 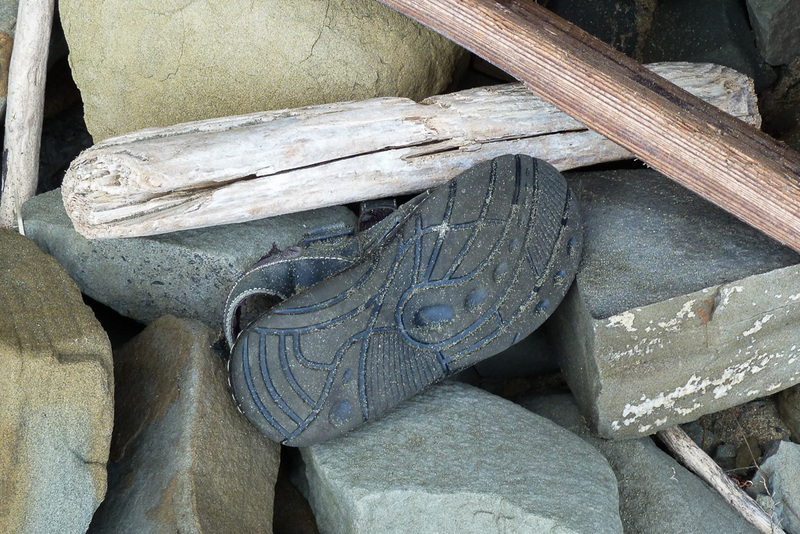 Whilst looking around, I did spot the sole of a shoe that had an almost ‘ye olde’ look to it wedged in the rocks. Then again, with the weathering action of the waves it may have only been there a week or so. Thinking it was actually from George Bass himself was probably a little optimistic. Actually, do I have to mention who ‘Big George’ is? I can’t relate the whole story, but briefly he was this wild man who rowed a boat with a bunch of other lunatics down the coast from New South Wales to Victoria, discovering things along the way. That’s roughly about it and I’m sure checking Wikipedia would be handier to tell his story than what I’ve just described. 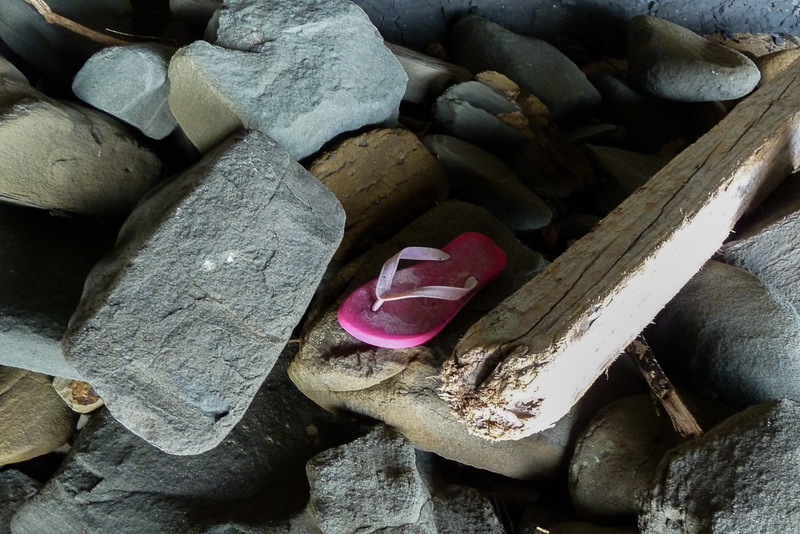 Well, on we walked amongst the next pile of driftwood and finally my 100% ‘shoe record’ was intact, as even the umpire couldn’t knock this one out as not being a shoe. Actually, I was over the shoe hunt, as a quick glance around this spot made me think it had been set up as some sort of joke. I was waiting for Allen Funt to pop up from behind a nearby rock, as the entire area was footwear madness. Can you stop now? I’ve had enough of footwear. My god, I never want to see any more footwear again after being bombarded with it in such a short period of time. Anyway, that search was over and I noticed the first annoying error of the day. I’d taken my Garmin GPS with me to cross-reference against the iPhone ‘Walkmeter’ app I was also using, but upon checking the GPS, I noticed it wasn’t on. Okay, turn it back on should be simple, shouldn’t it? This is what I did, but it wouldn’t fire up again, so either it had crapped itself or the batteries were flat. Mm… I was pretty sure the batteries had plenty of life in them. Oh well, for my final statistics of the walk I was hoping the iPhone would come through with the goods. 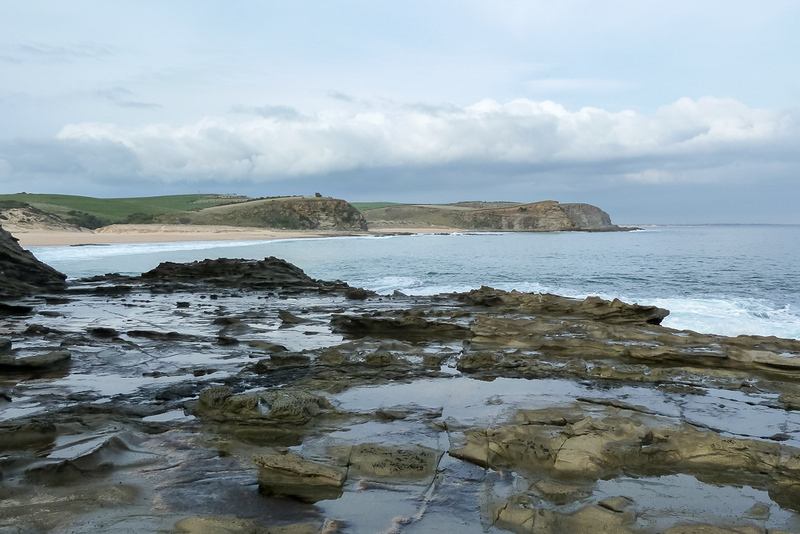 We’d spent some looking around and there was still a fair way to go if we were to make it anywhere near Kilcunda. 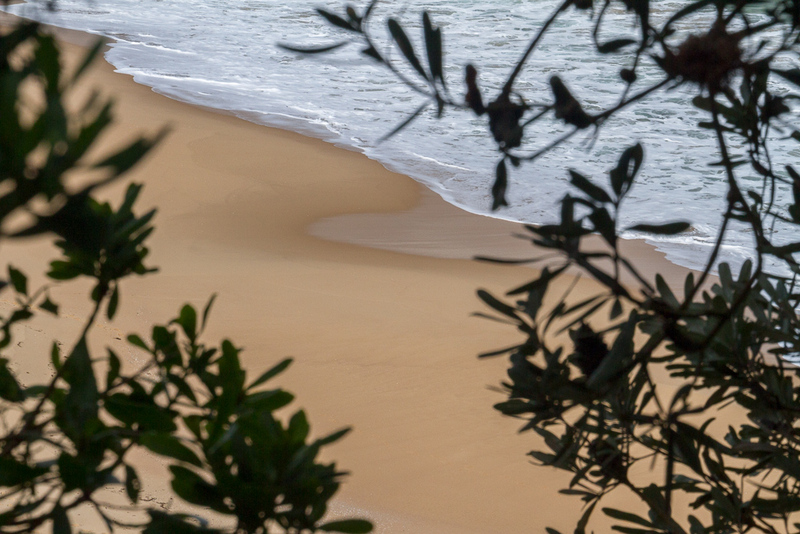 We decided to speed up a little and continued on a combination of rocky headlands and sandy beaches. There were plenty of stops for photos along the way though. 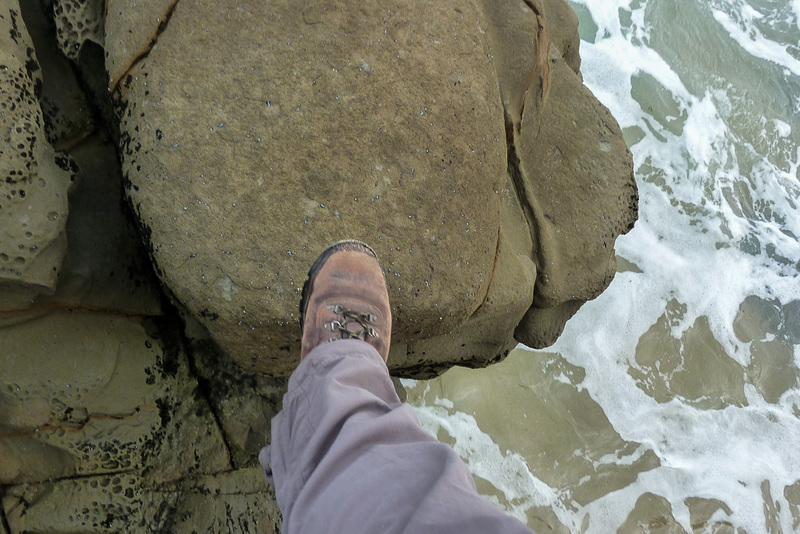 Even though the water was flat, it still had the sneakiness to suddenly surge up when we were crossing the rocks. 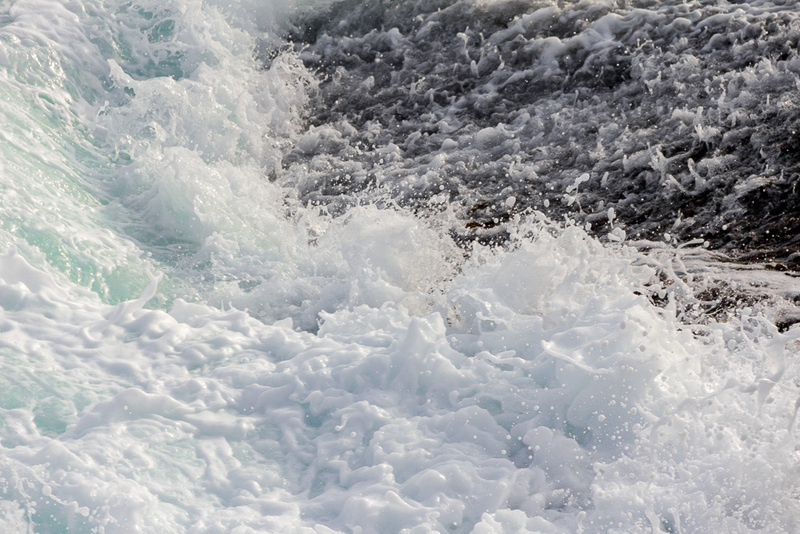 I always try and keep an eye on the sea when walking across these spots, as I remember being knocked off my feet by an unexpected wave when I was a kid. Getting washed across rocks with no way of stopping was a little disappointing and the only reason I didn’t end up amongst the kelp and ocean was my brother grabbing hold of me. Definitely something to remember, even a million years after it happened. 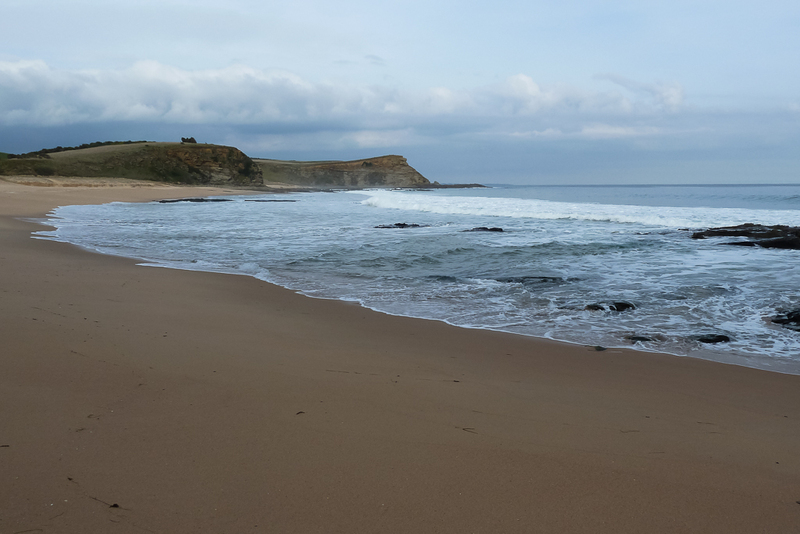 We reached a nice sandy beach and decided to walk around a couple more headlands and then call it quits for the day. The way the time was going, there was no way we’d finish in daylight and frankly, we were actually both feeling like crap due to the head colds. I was hoping for a bit of a sunset, but the grey sky was keeping the sun well hidden, so that was looking unlikely. …until it looked like the Yeti had strolled through. I guess when walking together a lot of times we’re just talking waffle. We did discover some things though, as Ben admitted he was addicted to chocolate. He can’t give it up and go cold turkey even though I’ve warned him he might end up as a diabetic. I had to face my own demons and admit I’m addicted to potatoes. Fried, baked, whatever, I need my spuds and I’m not sure if I can face life without the prospect of more potatoes heading my way. We were really solving the worlds problems on this walk. Due to the time, we made a decision to head up to the top of the surrounding hills and find the track up top and head back to the car. 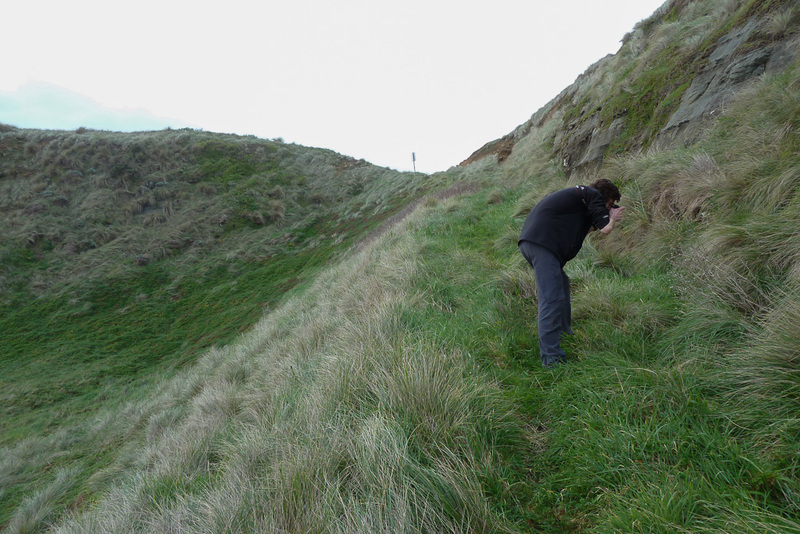 Finding a good spot to head up was a bit more of a struggle though, as I kept wanting to see what was going on around the next headland. 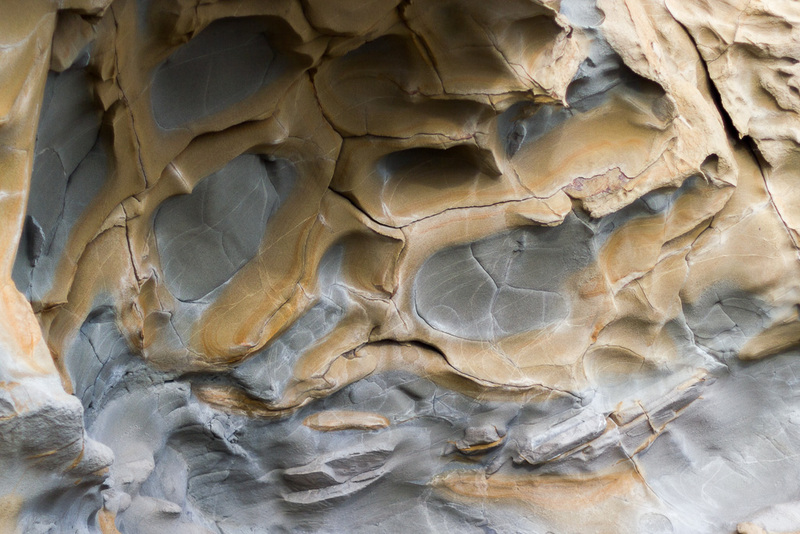 There were still things to look on the rocky beach and the richly coloured and worn rocks were interesting. 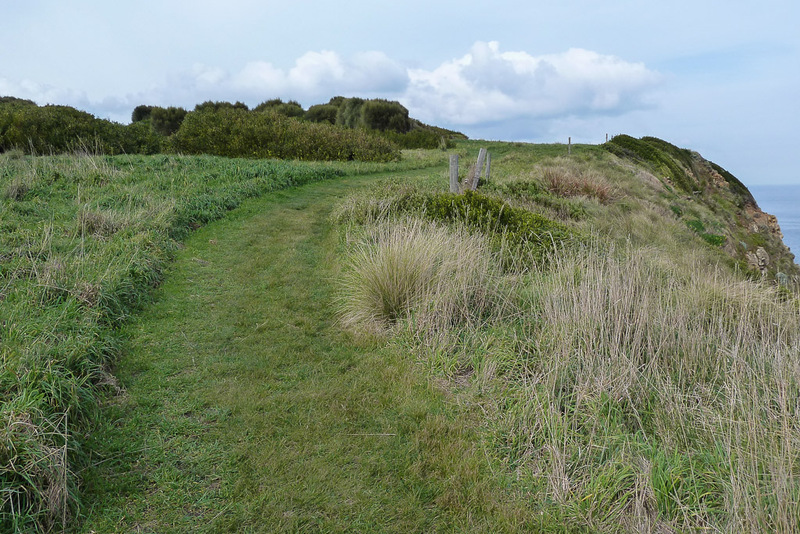 A bit of probing along the top of the beach and we found what looked like an old track, leading up from the sand dunes. 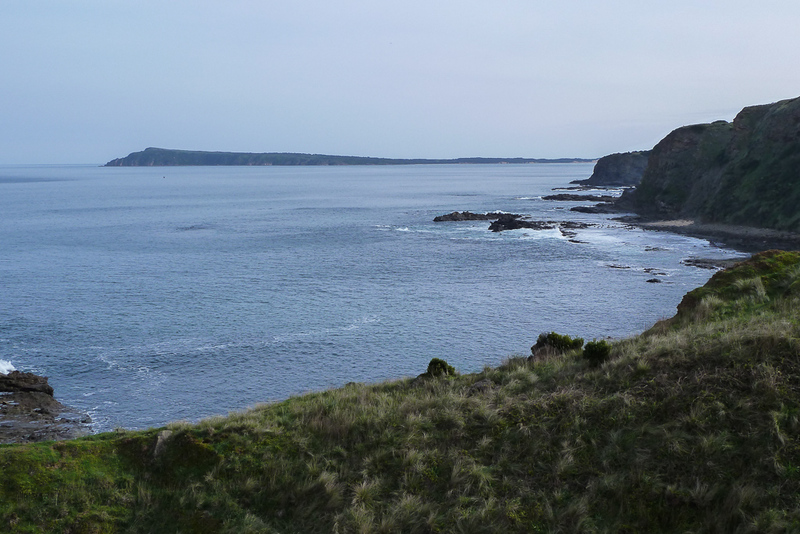 That was the target, but there was a final look at the water and Phillip Island in the distance. With a bit of stumbling we dragged ourselves off the dunes and got onto the old track. My head cold had suddenly caught up with me, as I now felt officially stuffed. I was sweating and feeling really ordinary, whilst thinking it probably wasn’t a good idea to be exercising in this condition. 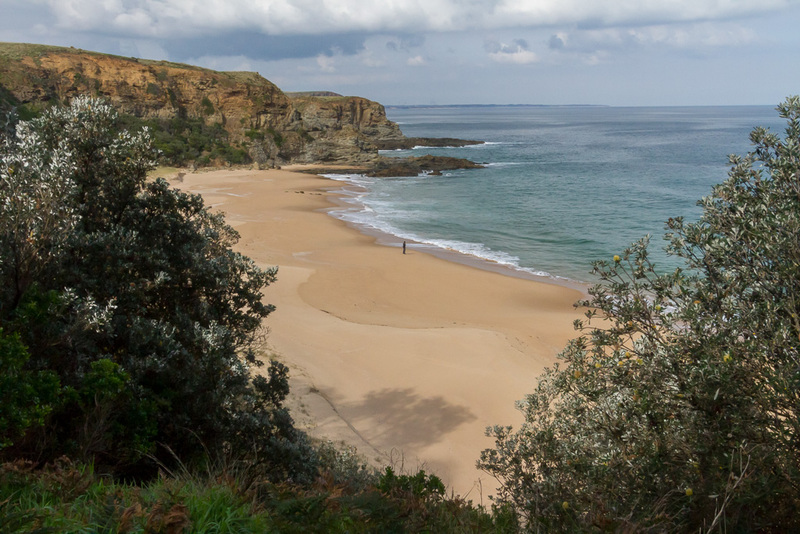 A short uphill stroll from the beach had me puffing and stopping every few metres or so. 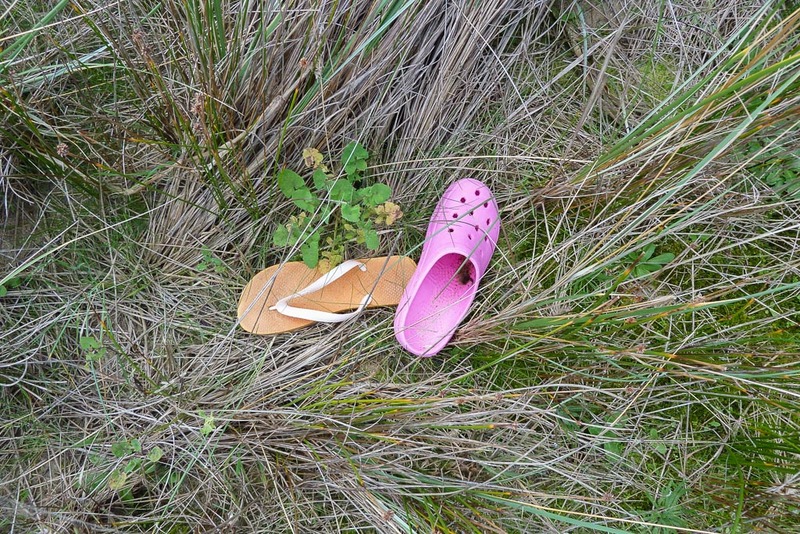 Just to rub the horror in a little more, we came across more stinking footwear abandoned in the grass next to the track. Oh no! 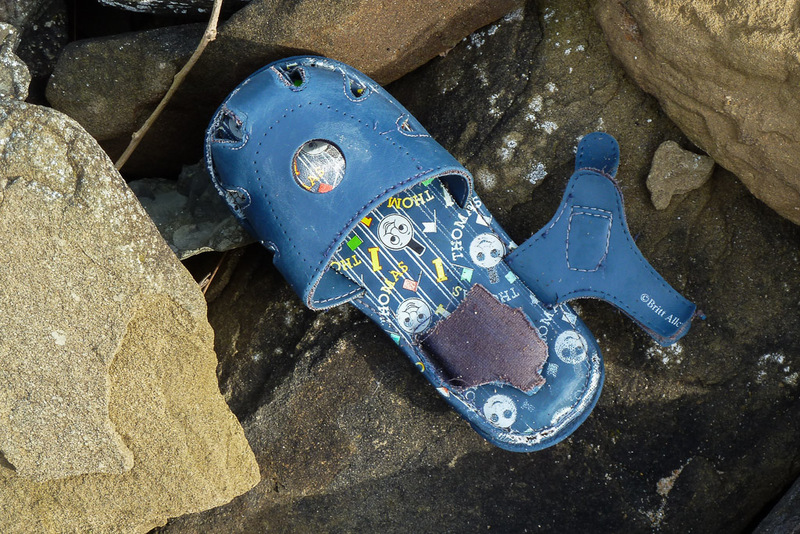 Even in the grass there’s more bloody footwear! Ben led the way, whilst I struggled up like an old steam locomotive. We were now back on the lawnmower path and it seemed to be comfortable walking. Hopefully within an hour we’d be back at the car. Unfortunately though, the track suddenly went downhill and ended up on a sandy path. If I didn’t know better it felt like we were headed back to the beach, which made no sense to me, as I thought the path kept going on top of the cliffs. Guess what? Hang on? We’re back on the beach?! Yep, the path led straight back to the beach where we’d been less than an hour ago, which made our struggle up to the top quite worthless. 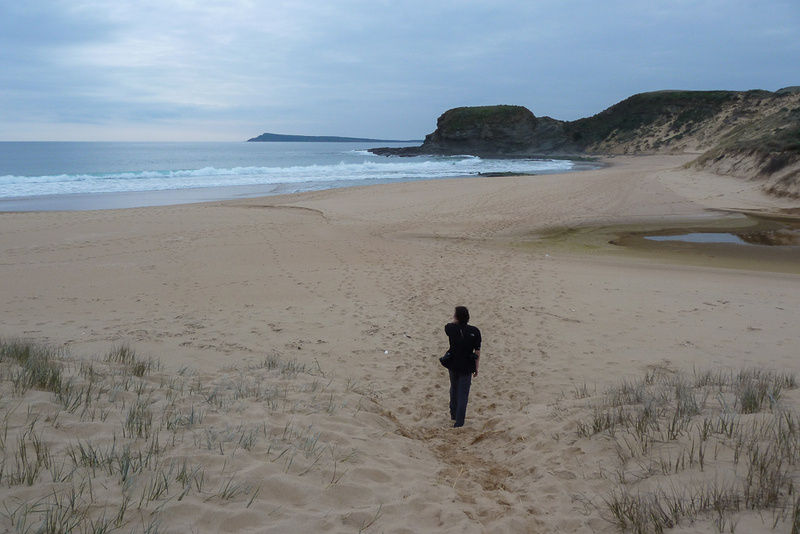 Now at sea level again, we decided to retrace our steps along the beach instead of climbing up the cliffs again. 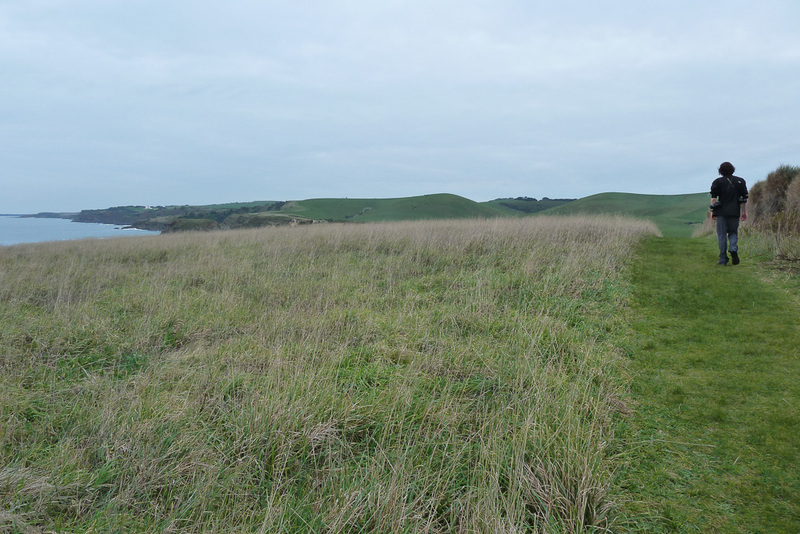 With the tide out and firmer sand on offer, we were hoping to make up some ground, whereas the cliff-top path is an undulating affair by the looks of it. Things were going well, but there was always going to be a bit of a ‘bummer’ involved somewhere. If I’m tired at the end of a day of walking, then that’s the time I most likely will fall over. I already know this, but do you think it helps? Then again, I’ve been known to fall over in the morning as well. Oh yeah, sometimes in the afternoon is also a problem. I don’t make it any easier for myself though, as this picture shows. 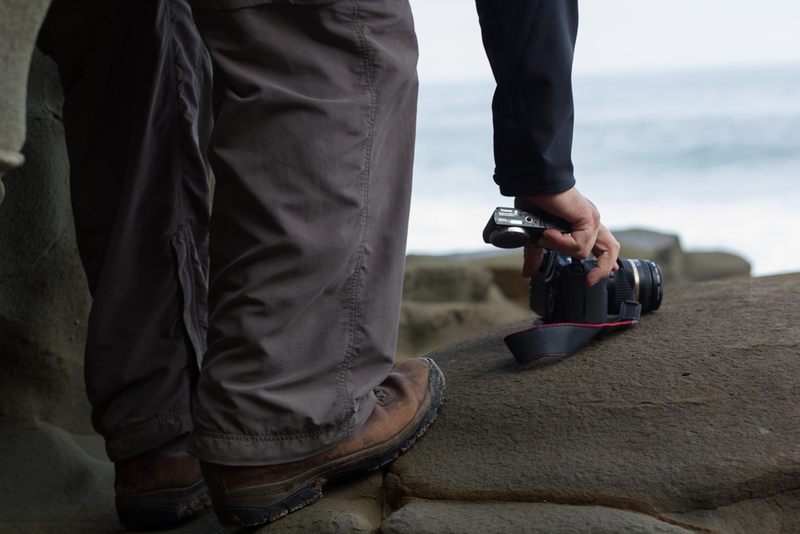 Rock hopping, whilst carrying two cameras at once is pushing the limits a little. 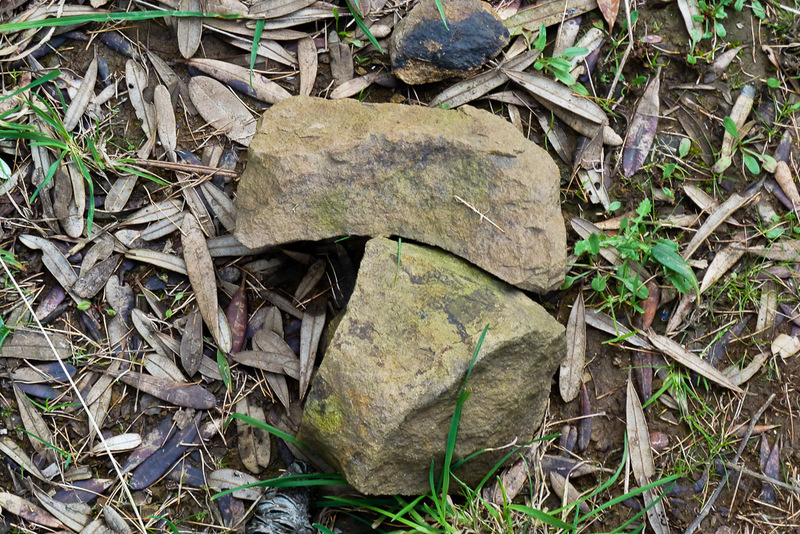 This time I was strolling along the rocks when I stepped on some slippery green/brown ‘stuff’ and immediately my legs flew out from underneath me. I fell sideways on my hip, whilst placing the camera down in a casual sort of ‘clanking’ sound at the same time. Unfortunately for me, I’d not picked a soft rock and it was quite painful overall. 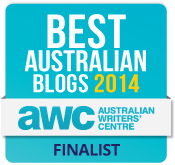 There was the odd popping and cracking noises from my vertebrae, which was a worry considering how my neck has been. 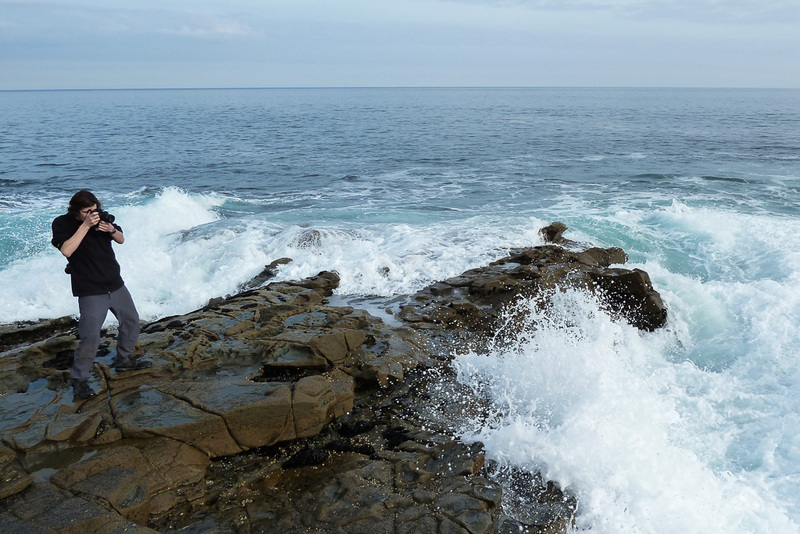 In fact, it felt like I had whiplash, as I crunched onto the rocks and it certainly rung my bell. There was absolutely no mojo to hop up straight away, so I lay on the ground for a minute or two to recover and check if all of my limbs were still working. Ben managed to get a photo of my resting position, which was the main thing. Just relaxing whilst hoping I wasn’t paralysed. Oh yeah, another method to make falling over more interesting, is I always take a photo from the position I end up in. The following angle shows the direction we were heading back to the car. Quite relaxing. Sort of. I felt like my dad’s famous quote of, “I thought it was the beginning of the end, but it was the end of the beginning.” Mm… Can you repeat that, as I’ve no idea what that means? Then again he did lie on the couch one day and say, “I’m dying and all I wanted was to be able to see the Sydney Olympics”. Well, about 25 Olympics later he’s still going strong and probably now saying he just wants to see the London Games before dying (again). Splattered on the rocks view. I officially was at the point where I’d had enough. A few more minutes on the ground and as I gingerly got up, I noted my hip was pretty sore, plus the neck was a bit rickety. I can’t wait to tell my neurosurgeon about that one. He’ll be mildly annoyed, but also pleased, as he’ll be doing the operation and consequently making the money from it. 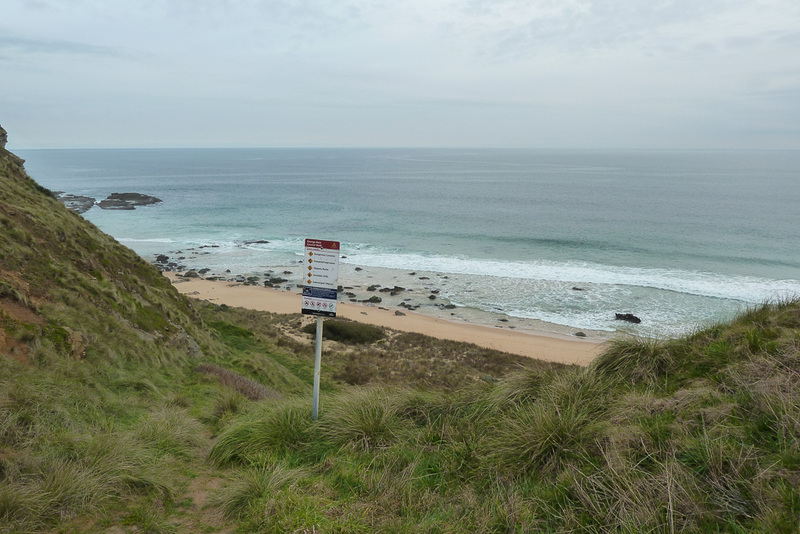 The aching joints combined with the cold made the struggle a little bit more painful, but with a bit more walking we soon found the path that leads out of Half Moon Bay. We were now back on the track and with not a great distance to go. The pink ‘Barbie’ house was glowing ahead like a beacon leading us back to the car. Light was quite dim and the sunset I was hoping for was nowhere to be seen. Really, the cloud cover was no different than when we started walking. A little bit further and we reached the car park. Well, Ben was there about 20 minutes before me and now it was time to check the statistics. Without a GPS reading I can’t be certain, but my iPhone app said we’d covered 11 km. I would’ve liked the Garmin to be working to cross-reference, but that’s the way it goes. We were both stuffed from the colds and the prospect of the drive home wasn’t that appealing. I was hoping to drive to Rhyll on Phillip Island to have the famed fish and chips for tea and take a few photos of the moon whilst eating. Guess what? When we got there the shop was closed as the owners had ‘Gone fishin” and the moon was nowhere to be seen behind heavy cloud. The best laid plans never seem to work out do they? Instead, it was off home then and on reflection the George Bass Coastal Walk is a bit of fun, even if we didn’t do the whole distance. There’s the mower track, the pink house, the odd thousand pieces of abandoned footwear on offer to keep one busy for a day. Goat, yeah, I think I was slightly deluded thinking that someone with a stack of money would build something discreet in relation to the surrounding environment. How silly of me! That's a good point about the shipping containers. 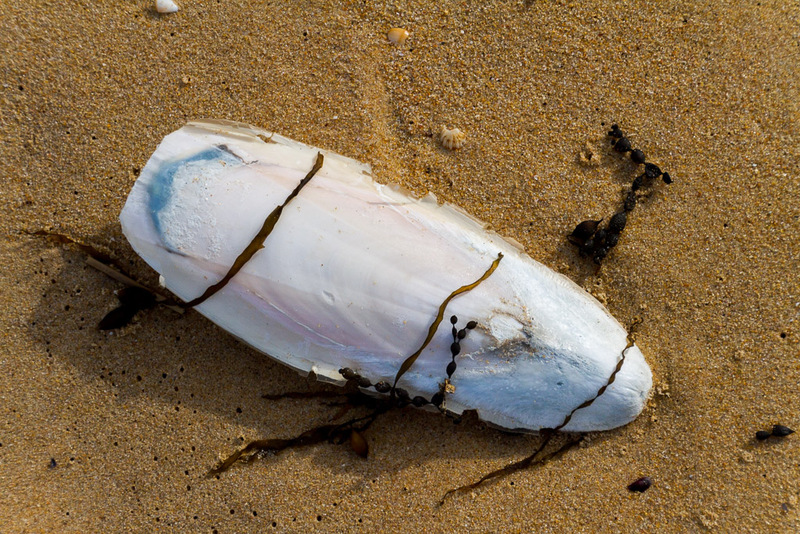 It just shows how much of that crap is floating out in the oceans until a storm or two bring them inshore. Always cheap footwear though, why couldn't it be a pair of shoes and then it might be a bit interesting? Even better would be the odd Rolex washed in?! Those rocks do look very GOW-like. I should do some research to find out. Then again I could do nothing and next time I see something like that again, I could scratch my head and go, "I think I've seen rock formations like this before…"
Absolutely beautiful. The mower track and the views of Half Moon Bay from above are awesome. Thanks for sharing your experiences Greg. Jeff, thanks for visiting. 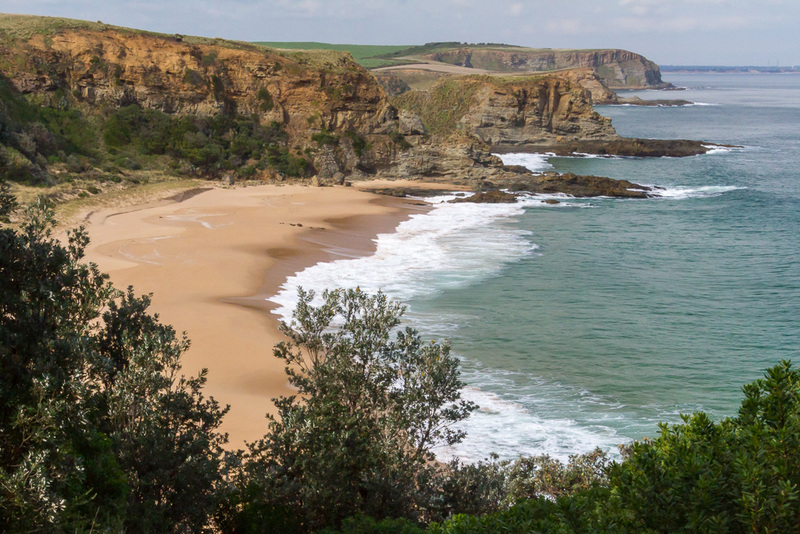 The Victorian coast is full of these great spots. 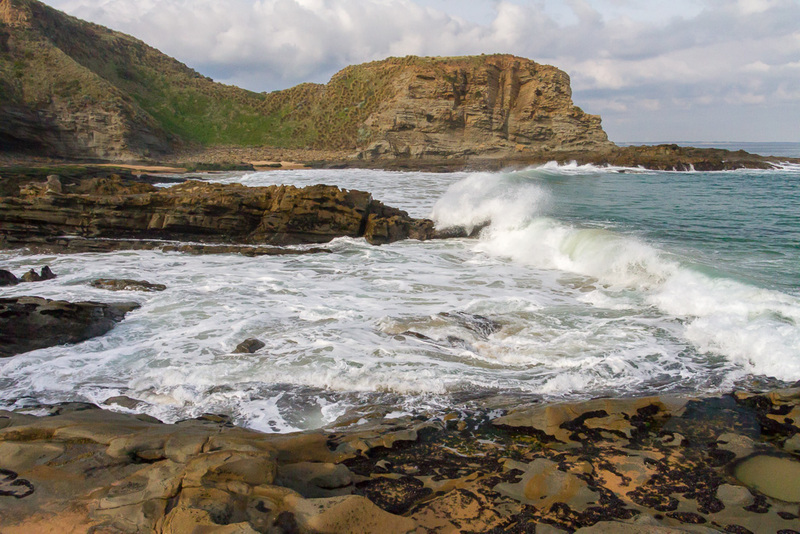 I'd love to come back to this walk on a stormy day with a big swell rolling in. 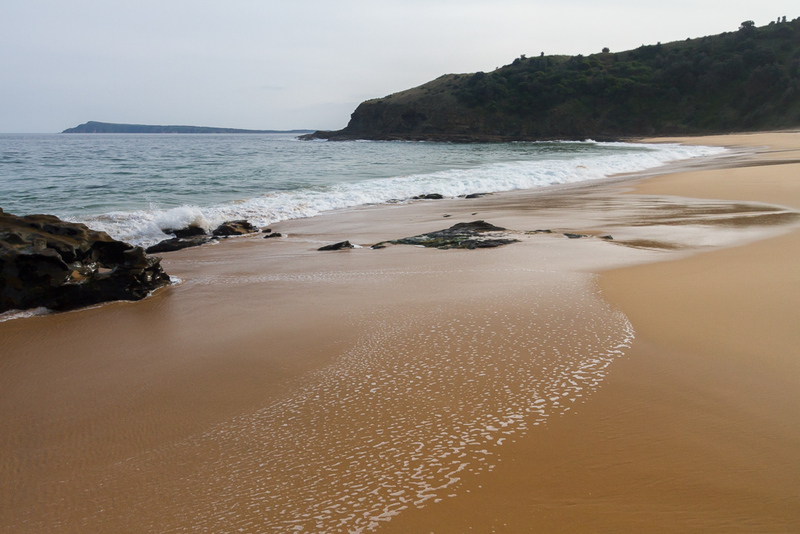 Nothing beats a wintry beach I reckon! 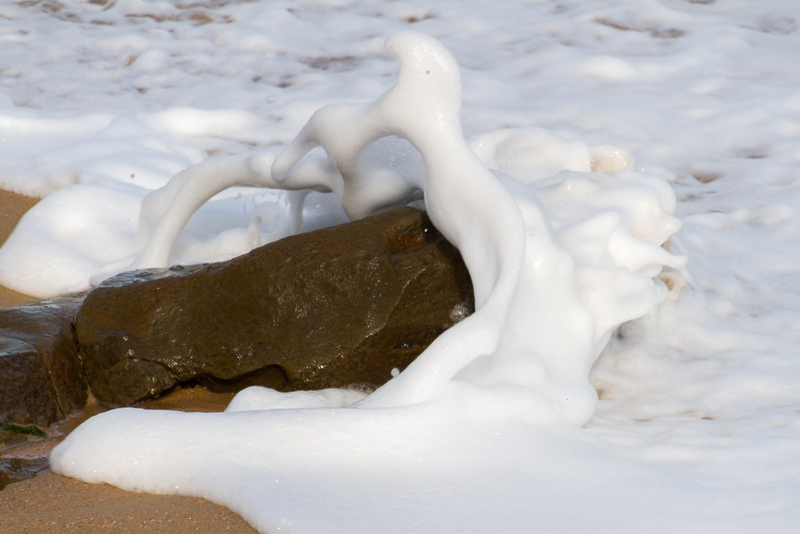 Also, the photos are terrific – the untitled one of a small, foamy wave breaking over a stone on the sand is a stand-out. 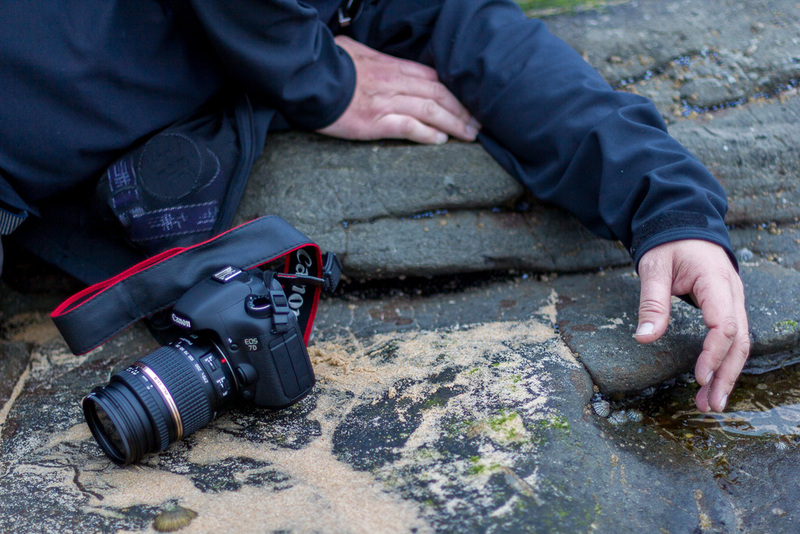 Absolutely gorgeous photos and incredibly funny, Greg!